Festivals have arrived but with hardships for the ordinary people - Integration Through Media ....! 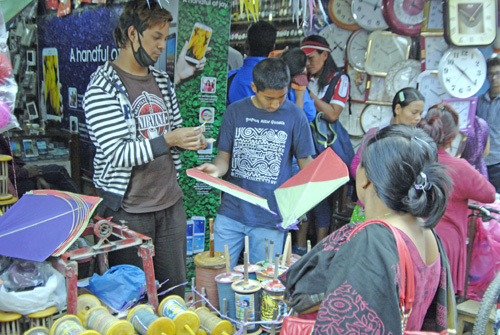 Pritam Bhattarai, KATHMANDU: The season in general, the market abuzz with people buying new clothes, goods and essentials, and media advertizements announcing hoards of discounts from food to cereals, liquor to furniture, paints and clothing, signal the arrival of a festive season in the country. And the closest one is Dashain, a festival synonymous with happiness and unions of family and friends. At the same time, it also serves an opportunity for many, especially the service-providers to make fast money under various pretexts. The perennial problem is the price of cereals and essentials that skyrocket during festivals, either by creating artificial shortage or a blanket price hike. The ultimate sufferers from such selfish activities are the common people at large. There is no exception this year too. Price of vegetables has already almost doubled in Kathmandu valley, while cost of goods and essentials has also increased comparatively. The price increment has affected the poor and students in general. “Every year especially during festivals, price of essentials and vegetables increases under different pretext. If this continues for some more days, there will no other option left than to sustain on dry foods,” said Naresh Rijal, who is pursuing LLB (second year) at Nepal Law Campus. As a student, he relies on the monthly financial support that his family sends from his village home. When asked why price of vegetables increased unexpectedly, a vegetable seller at Kalimati said the recent flooding in Tarai belt caused all these. “A large chunk of vegetable farming was damaged in the disaster, causing the shortage,” he added. Absence of the government is also evident in transport sector, and roads. In general, bus ticket booking for the Dashain festival is open almost one month ago. But this year, the booking is yet to open. According to reports, transport entrepreneurs are lobbying for an increment in travel fare, taking undue advantage of the festival. Their logic is that since the price of vehicle parts have increased after 2015, this should be compensated by increasing the fare. Last year too, transport operators had threatened not to open the ticket booking for Dashain until the government addressed their demand to give them route permits to ply the destinations of their choice. While the Department of Transport Management (DoTM) is said to be adamant about not giving in to the demands of the transport operators, the ticket booking is further delayed, it seems. Whatever may be the reason behind the delay, it is the right of the general people to travel safely. Concerned transport operators must abide by the rules and regulations. In the case of the delay in ticket booking, it is unfair to hike fare, taking opportunity of the festival. It will affect the general people ultimately. “Every year during Dashain, it is like a herculean task to book a ticket as ticket booking is closed within a few hours after it has opened. The government should take this matter into account,” said Dambar Gyawali, who owns a wholesale shop at Ranjanagalli in New Road. The government must take initiatives to ensure safe and hassle free travel for people leaving the valley for the festival. It may use Sajha Yatayat or take other alternatives in this regard. It may be noted that almost one-thirds of the population of the valley leaves to their respective home districts for the festival. Failure to repair Narayangadh-Muglin in time, a gateway to various districts from the valley, is sure to make journey of Dashain celebrators painful this time. Although the date to complete the project has expired many times, it continues to be delayed further. Many people have died and many others were injured along the road due to landslides caused in part by the project.